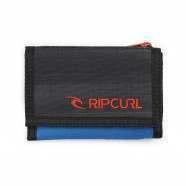 Quiksilver Wallets - Quiksilver Quik Travel Wallet - Dark Shadow :: Men > Wallets. Nylon ripstop designMen's trave walletMaterial: 100% PolyesterPrinted branding to the frontPen holderPerfect for passports. cards and other essentialsZip closure Size: one size.